Heavenly Father, we pray for the virtue of patience, in our hearts, homes and our lives. We want to wait patiently for Your will to enfold in our lives. May we learn to wait patiently for You to bring Your answers to our prayers. We want to cooperate and wait on Your plans for us. Hebrews 4 : 12 For the word of God is living and active, sharper than any two-edged sword, piercing to the division of soul and of spirit, of joints and of marrow, and discerning the thoughts and intentions of the heart. As we wait on You, we pray to turn to Your Word for comfort and direction. Your Word is solid and reliable. The Word brings us truth. Your Word gives us strength. The Mighty Word of God chases away our worries and our fears. The Gentle Word refreshes us. Romans 5 : 3- 4 Not only that, but we rejoice in our sufferings, knowing that suffering produces endurance, and endurance produces character, and character produces. Lord, teach us to be patient – with life, with people, and with ourselves. We sometimes try to hurry things along too much, and we push for answers before the time is right. Teach us to trust Your sense of timing rather than our own and to surrender our will to Your greater and wiser plan. Help us let life unfold slowly, and teach us to savor each experience and learn the lessons behind each story. James 5 : 7 Be patient, therefore, brothers, until the coming of the Lord. See how the farmer waits for the precious fruit of the earth, being patient about it, until it receives the early and the late rains. Teach us Lord, to be sweet and gentle in all the events of our lives, in disappointments, in the thoughtlessness of others, in the insincerity of those we trust, in the unfaithfulness of those on whom we rely on. Let us forget ourselves so that we may enjoy the happiness of others. Let us always hide our little pains and heartaches so that we may be the only one to suffer from them. Teach us to be patient in our suffering and learn to profit by the suffering that comes across our path. Colossians 1:11 May you be strengthened with all power, according to His glorious might, for all endurance and patience with joy. Lord, we ask You to grant us the virtue of patience. We pray that it may mellow us, not harden or embitter us, that it may make us not irritable. That it may make us broad in our forgiveness, and never narrow, proud or overbearing. May no one be less good for having come within our influence. No one less pure, less true, less kind, less noble, for having been a fellow believer with us, in our journey towards an eternal life with You Lord Jesus Christ, Amen! Fasting today and praying, filled with love, joy and the spirit. These prayers are such a blessing. Thank you lord for teaching us how to be patient. Knowing as long as we can abide by your spirit all thinks are possible. Awesome prayer thank you SIR.GOD BLESS YOU ALWAYS. I thank you dear father to teach me how to be patience with life. I praise You my dear Heavenly Father,my dear Lord Jesus Christ. I thank You to teach me,to be patient with life,with people,and with my self. Yes Lord Jesus,I will wait patiently to You,to answered my prayers. We all be patient to wait untill the coming of our Lord Jesus Christ.,our Savior. Thank You Lord Jesus,to give me the strength,to be patient,in everything I do in my daily life. I ask You dear God,please teach me,how to be patient with my life,with people and with my self. I will learn to follow Your word,my God’s word,to do everything in my life. Dear God, I will wait patiently to You,to answers my prayers. We all be patient to wait untill the coming of our Lord Jesus Christ,our Savior and our living Lord. Thank you so much for this beautiful prayer,full of God’s word. This is an excellent prayer. I needed to hear this this morning. Sometimes, we get really impatient with ourselves when we don’t get it right away. 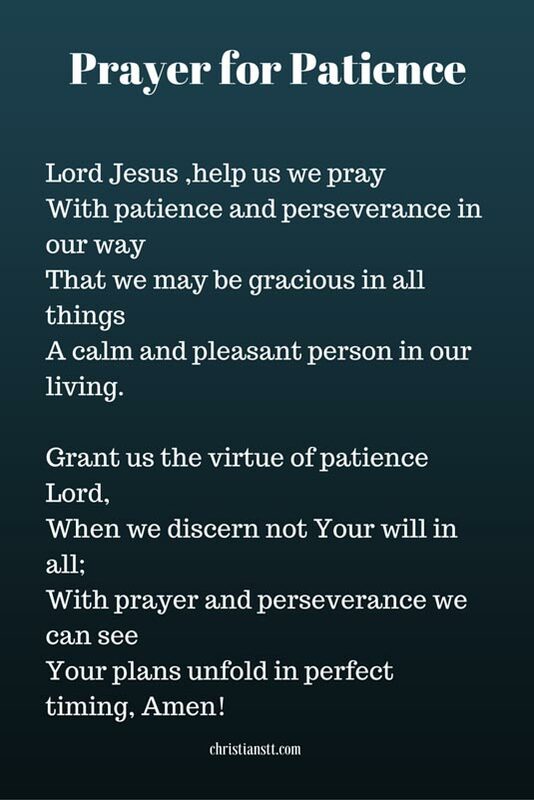 This prayer is teaching me about patience with myself. I have patience with others, but not with myself. I give it all to you, I can do nothing without you. We praise You dear Father in Heaven.We thank you for grant us the Virtue of patience. Dear Father God,We thank you to teach us to be patient with life,with people,and with ourselves. We will follow Your word to do all things in our life,and wait patiently to You,for answered our prayers. Thank you Lord,to teach us to be sweet and gentle in everything we do in our life. We all Be Patient,to wait until the coming of Our Lord Jesus Christ,Our Savior,and Our Living God. Thank you for this wonderful prayers. I praise You my dear Heavenly Father,for the virtue of patience,in our hearts,homes,and our lives.We want to wait patiencely for Your will to enfold in our lives. May we learn to wait patiencely for You to bring Your aswers to our prayers.We want to cooperate and wait on Your plan for us. Thank you Lord,that I know God today,because you bring God’s word each and every morning for me..
And thank you for always being there for me,and taking care of me,when I am down. In Jesus mighty name,I pray. Before I came to you Jesus, Patience was never my strong point…..I was an RN so I had lots of patience in my job but never a lot of patience for myself, Sometimes it’s easier to exercise patience with other people, than it is with ourselves. For most of us Patience does not come naturally for ourselves but with Gods help we can work at it, thank you Lord……. .”Yahweh is merciful and gracious, slow to anger, and abundant in loving kindness”. Today my wall clock stopped running. Reasonably a new battery, put it in on time change day here in TX. But the second hand doesn’t work anymore. God might feel about us like that sometime, not that he isn’t patient. However I need to be as patient with this wall clock as I hope Christ and Holy Dad (protestant) is with me. Patience , it’s a GOOD thing really. Thank you clock for having the personality with the Holy Spirit to teach me that lesson. AMEN. Hallelujah, I stand in agreement with this prayer. May God continually bless you and your family, thanks for sharing.